common/uncommon/rare sets of cards - to all of us. Now that we're getting into the teens as far as number of characters, it's a good idea to give these a look. Evan recently got started with some thoughts, but now we have even more since then. So, here are some quick hit reviews of what we see - trust me, the in-depth stuff is coming when we can put it into the context of, well, everything. Common: A sidekick tutor - this is cool and starts to get to what I'm looking for. Plus, between the fielding ability and the global, this is really going to keep your bag thing. This is an exotic form of churn, and I love it. Big buys will be possible FAST just for having this one somewhere on the board. Uncommon: Heroic with some life gain. It's hard to know of yet how heroic will impact things. Plus, I'm still not sold on life gain as something super important. Rare: The same global and a sidekick buff. Hey, if he gives you the chance to generate sidekicks, they might as well be buffed sidekicks. Common: One reason to start paying attention to faction-based teams. Rare: Interesting, but highly situational, and has a chance of doing nothing at all. Super rare: Basically probability control (a Heroclix ability). I like this a lot. This makes me want this card. Common: Pretty straightforward. I like the global on all three - I'm a big fan of blocker control Double bolt is pricey, but it's a nice ability. Considering that it has two elements - one damage, force to block - I think it's worth it. Uncommon: The classic "same as common but better" but at least in this case he's more expensive. Rare: Does this mean that he goes to used? We'll need some clarification here. Common: We talked about her on the show. Highly situational. Super Rare: Noticing a pattern? Common: I love blocker control, so I love this. Great, basic move. 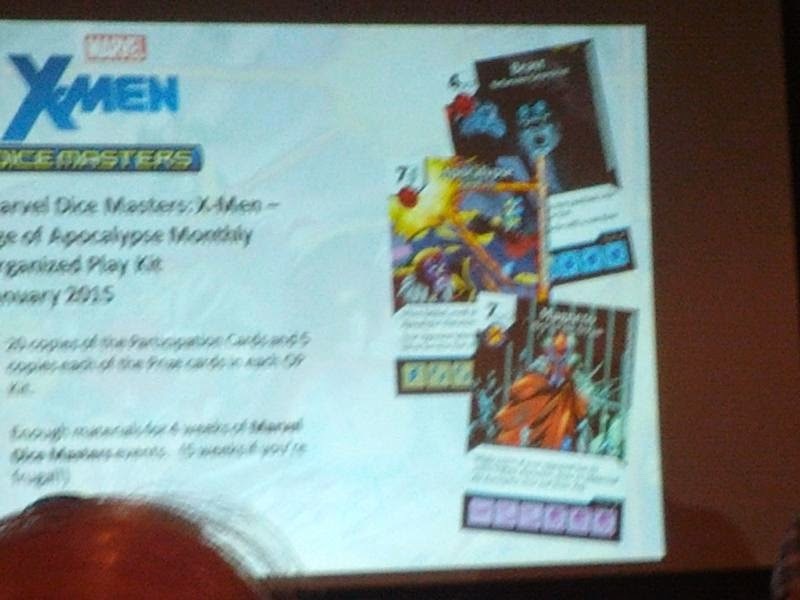 Plus, there will likely be lots of X-Men in this set! Right? Right? Uncommon: Of course, the global here basically renders the common moot, doesn't it? This is a cool ability. There are enticements in this set to go mono-faction, but we have cards that punish you for it too. Risk/reward! Rare: Same deal on the global, and the buff will probably be good given that, you know, X-Men are in this set. Common: Conservation of dice. I like it. Uncommon: A little slight-of-hand I guess? This is a nifty ability. Rare: I assume they mean ANY mask face. This could actually do a little damage, but then you have to be cool with a defender going to used. Common: Spinning! Good to see this again. Uncommon: An interesting pair with Professor X, perhaps, if you want extreme life gain. Spinning down is interesting too. In "block" play (as in, only UXM) Beast isn't an issue so spinning down could be smart. Rare: I just don't like that it loses usefulness if you have her on the level 3 face. Common: Another punishment for a lack of villains. Uncommon: And now we have a situation where villains might be preferable. And the global? Very interesting. Like with NOGG, you might want someone knocked out, so it could be an easy play. Rare: I feel like there are interesting interactions to be had with his global and his card text. Common: The potential for an unblockable 5/5 is pretty cool. Uncommon: Hopefully basic actions become a lot more omnipresent for this card's sake. Rare: He gives you a friend in what could be a bad situation. A spare blocker is never a bad thing. Common: She takes care of trouble. Like Tsarina. Or Beast. Just throw out the old power cards, this set won't let you use 'em. Uncommon: This is interesting, but I don't know how much I like it. I feel like it has too many moving parts. Rare: This is powerful and could be amazing in the right situation. If you can cycle her and afford the dice, go for it. Perhaps she'd pair well with Professor X and his influx of sidekicks. Common: Powerful stats, low purchase, and a drawback? I love it! Uncommon: Blocker control, and making energy types matter. This is fine with me. That character will likely be KO'd. Rare: Another semi-drawback. I like caveats. She might otherwise be a 6 cost. Common: I'm not a huge fan of this mechanic being used in this way, but I understand it. After a while, it's not useful, and if you field it on three already, it's not going to matter. Uncommon: This is a bit more like it. Other things can spin him around as needed, and then let this ability do the trick. Nothing like a little resurrection. Rare: Holy text! Don't worry though, it's just the reminder text for heroic. I wonder if other heroics depend on the same deal? Common: Simple. Straightforward. With his stats you NEED to block him, but you'll still get pinged. Uncommon: The variability of this is what I like. The global encourages bolt-heavy teams in a way that enthuses me. Rare: This is pretty awesome too in a smilar way. You WANT a bolt team with him. Common: Lets you save a KO for when you need it. This could come through in clutch moments. Uncommon: A bit situational. Don't love it. 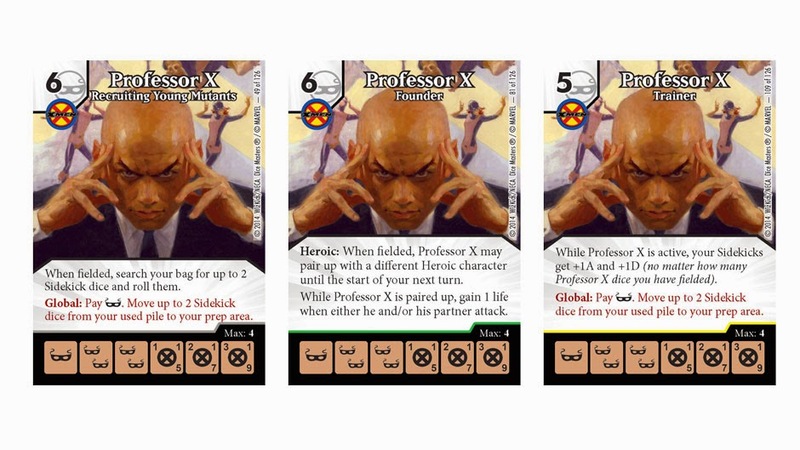 I am really digging that global with Professor X. On my first turn, I could buy a 2 or 3 cost character, pay 1 mask, and move 2 of the sidekick dice I just paid for a character with to my prep area. SUPER easy way to be able to buy a 6 cost character on turn 2, AND you were able to buy a 2 or 3 cost on the first turn as well. On rare Cable I'm pretty sure he would not go to used since he is blocked. Only the damage goes through as if unblocked. He is still blocked in every other sense. The global on Cable is an awesome Johnny Storm counter. I actually really like the Psylocke card as a way to KO sidekicks and lvl one Beasts. Pair this up with uncommon Cerebro and the Beast wall is essentially gone. Also the SK ko is great because this is another much needed arrow in the anti-Gobby quiver. I wish the X-23 rare did a little more than buff +1D. I'd almost be inclined to pay the extra energy to get the much better uncommon ability. Agree on Common Sabertooth, but this is Tsarina shutdown. That rare Pyro is just plain scary. Thematic as well be cause &quot;holy crap there's a conflagration coming straight for me!&quot; By the way, the 2 cost Ghost Rider or 2 cost HT (hey two guys on fire!) is now almost automatic with this guy since they are best way to compile double bolts in your used pile quickly. Still, Pyro teams take longer to set up than you might think and they are weak to a bunch of pretty straightfoward attacks. Can't really see Pyro in the same light as say, Gobby or Tsarina. For example, one Nightcrawler Fuzzy Elf just murders this team. Cerebro is so great. And this is the main thing I think (along with Imprisoned) that you'll need Namor to cancel. I'll have to disagree on your assessment of the uncommon though. For only 3 cost and allowing 3 dice, you can basically completely shut down a Hawkeye, Beast, Black Widow team. Also this is HUGELY effective against Gobby. It's not the first thing you do, but once you've stabilized with Gobbys in the field and SKs out of the field, it's pretty great to then slap a Cerebro on Green Goblin. Then you can feel free to KO those suckers. Yeah - I agree on the global. To me that is by a large margin the most game changing thing we've seen yet from this set.